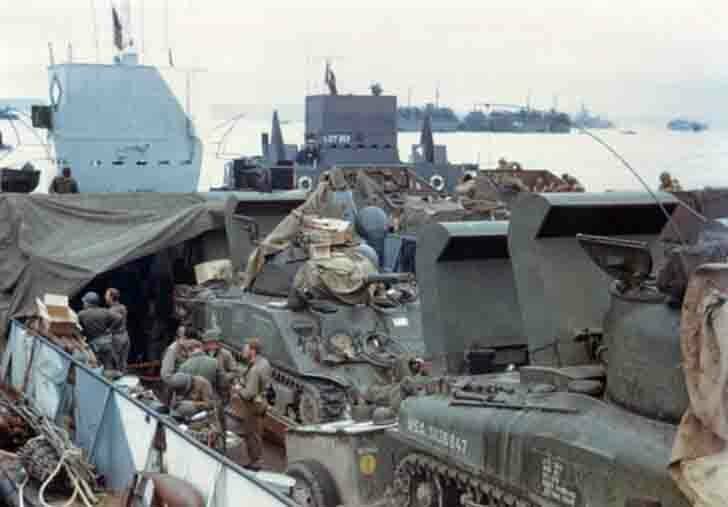 American M4 “Sherman” medium tanks placed on the landing ships, which are intended for the invasion of Normandy (Operation Overlord). M4 “Sherman” – the basic American medium tank during World War II. M4 sherman medium tank was widely used in the US Army in all areas of fighting, as well as large quantities delivered to allies (notably the UK and the USSR) on the Lend-Lease program. After World War II m4 sherman medium tank was in the armies of many countries in the world, and also participated in a variety of post-war conflicts. The US Army m4 sherman medium tank was in service until the end of the Korean War. The name “Sherman” (in honor of the American Civil War General William Sherman) M4 tank was in the British Army, after which the name was assigned to the tank in the US and other armies. The Soviet tank crews had the nickname “emcha” (from the M4).